On Wednesday CCSD staff met with PCC leaders about early college offerings. On Wednesday of this week I attended a meeting at the Pueblo Community College Fremont Campus with CCHS principal Bret Meuli and counselor Tim Ritter where we worked with PCC leaders to brainstorm ways we might expand early college concurrent enrollment offerings toward granting our students the ability to earn Associates of Arts degrees, or CTE certificates in CNA, Visual Communications and Digital Media, Welding and Welding Technologies, Auto Service Technology, and Accounting. PCC is also hoping to set up such a program in Criminal Justice at some point in the future. This is wonderful work we are doing and, with the rising costs of a college education, could really open doors for many of our families to be able to afford coursework. 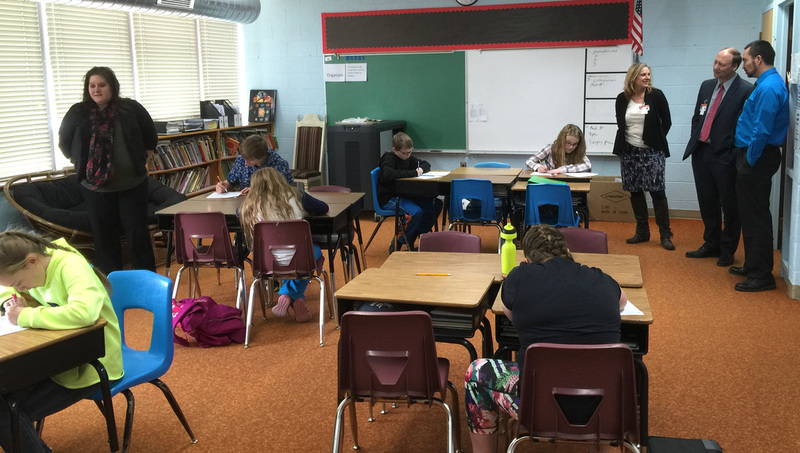 On Tuesday students in Donna Biemiller's class at McKinley Elementary were actively engaged in learning the difference between mean, median, and mode. While visiting Washington Elementary on Thursday morning for their mid-year review we observed wonderfully polite student behavior, and evidence of improved instruction at many levels (such as targeting lessons to our curriculum and purposeful engagement of all students in learning). We also verified effective use of available resources, both human and material, and evidence of reflective practice by the staff and principal in using student achievement data to guide instructional decision making processes. While visiting McKinley Elementary that afternoon we were impressed with the way the school provides small group targeted math instruction for all children at all levels. This means each child has an opportunity every day to get extra math instruction in small groups focused on their individual learning needs. We were also able to verify outstanding use of Task Force PLC time conducted on delayed start days. Additionally, we noticed effective scheduling and organization of human resources, positive and expert integration of special education students into regular classroom settings, and most teachers planning and posting clear learning targets, with evidence of extensive purposeful student engagement. Outside consultant Wendy Birhanzel, McKinley principal Brenda Manning, director of student services Dominic Carochi, and Washington principal Brian Zamarripa worked together on mid-year building reviews this past week. As can be seen we are currently focused on conducting and reporting out mid-year building reviews at Washington, McKinley, CCHS, CCMS, and Harrison. This is part of our process to support each school in defining its vision and measuring their actual accomplishment of it. All of our principals are also in the process of wrapping up mid-year teacher evaluations, and this means Director of Student Services Dominic Carochi can begin conducting their mid-year evaluations. We have also begun developing a 2016-17 academic calendar, writing grants related to health and wellness, facilities improvement, improving elementary reading outcomes, and supporting our most at-risk high school students toward graduation. On Friday I engaged with Leadership Denver about key issues revolving around education in Colorado. Because of our snow day on Monday I spent the day rescheduling mid-year building evaluations for CCHS, CCMS, and Harrison K-8 School that had been planned for early in the week. On Tuesday we had a delayed start due to weather. However, I was able to make it to my monthly radio interview at KRLN, attend a superintendent advisory council meeting, work a bit on our BEST facilities grant application, and meet with some directors about their mid-year evaluations. On Wednesday I had a central office staff meeting, more and a meeting with PCC Fremont Campus officials about extending more concurrent enrollment opportunities to CCHS students. I also attended a CDE webinar on Wednesday afternoon about an Early Literacy Grant opportunity we hope to take advantage of. On Thursday director of student services Dominic Carochi and I were part of a team that conducted in depth mid-year building reviews of Washington and Mckinley Elementary schools. On Friday I met with CCHS counseling staff about a Colorado Counselor Corps grant we are writing, and then I travelled to Manual High School in Denver to address a gathering of Leadership Denver participants about education challenges in the state of Colorado. On Monday I’ll focus on truancy and health plan matters. We also have a board work session and regular meeting on Monday evening. At the work session we’ll focus our efforts on budgeting, preparing for spring contract negotiations, and conducting the annual superintendent evaluation process. On Tuesday our BEST Task Force committee meets once again, plus we’ll hold Leadership and Calendar Committee meetings. On Wednesday and Thursday we’ll conduct our postponed CCHS, CCMS, and Harrison mid-year building reviews. On Friday my attention will shift to statewide legislative matters as I attend a Pikes Peak Area Superintendent Association meeting. Thanks for listening once again, and congratulations to the Broncos for wining Super Bowl 50!